If you’re looking for a simple project to use as a get to know you activity, or a guided activity to transition back to school after a vacation (hello winter and spring break!) 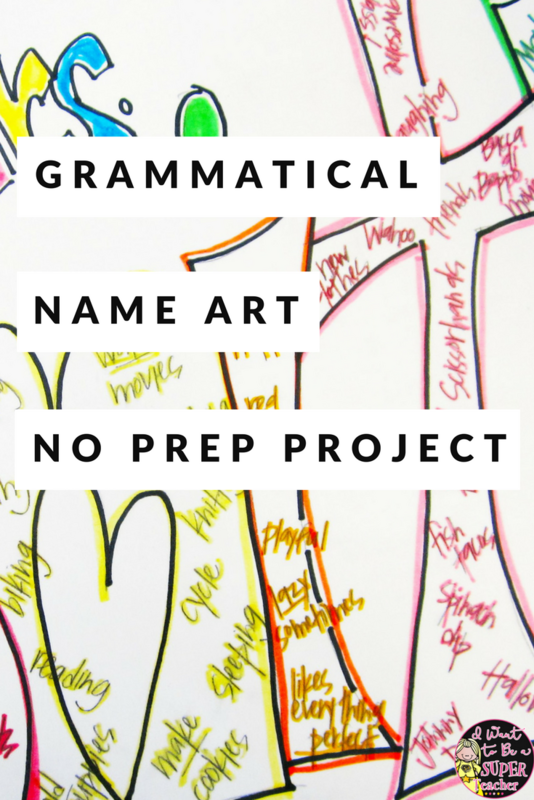 grammatical name art is perfect go-to activity. 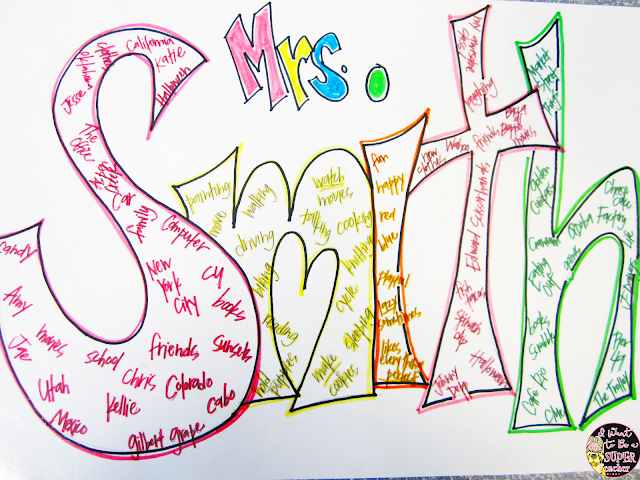 Grammatical name art can also be used as a fun “All About Us” bulletin board or an end of the year activity (have students brainstorm words that relate to your school year together). It also works any old time you need to do a parts of speech review. Grammatical name art is fun, easy, and requires almost ZERO PREP. Just get one large piece of white art paper for every student and you’re ready to go! Step 1: Write your name in bubble letters – in pencil of course! For students having stress about bubble letters, just have them lightly write their name in large letters and then trace an inch around the entire letter they just wrote. There are many more important things in life to stress about than bubble letters. Step 2: Fill the first letter with nouns that relate to you. These can be common or proper nouns. Just make sure you capitalize the proper nouns! Step 3: Fill the second letter with verbs that relate to you. Action or linking verbs both work. If you are writing a phrase like “make cookies” make sure you underline the verb. Step 6: When students are done with the words inside their letters they can add color and share their work with friends or a partner. This step is especially important if you’re using this activity after a break when students are dying to share what they did/where they went/a gift they received. You can have students put their grammatical name art around the room and have other students peruse these “gallery walk” style or do an inside/outside circle where students share words from their art until it’s time to rotate. As long as the kids feel like they got a chance to talk about whatever is exciting to them then you’re good to go. The gallery walk option is a good one as far as managing the classroom, since not all students have to be done at the same time to get this started. Once students finish, they bring you their art piece, you give them a piece of tape, they put their name art around the room and start gallery walking! This might also motivate some of your “struggle to finish in a timely way” kiddos who might be motivated to finish their name art and start a gallery walk. Do you have any other ideas for low (or NO) prep activities you like to use throughout the year? Tell me about them in the comments! Previous Post: « Camp Coyote Highlights – Last Week of School Fun! Great idea! I'm sticking this one in my grammar file. Thanks for sharing your ideas! Hi! I just found your blog. Love the name. I am your newest follower. I would love to have you stop by my blog when you get a chance. Thanks for coming by my blog today! I'm so glad you did…I'm following your blog now, and I love the grammatical name art! What a fun idea; not only a good way to reinforce parts of speech but also a great "get to know you activity." Im your newest fan! thanks for a great giveaway and loved your haloween outfit! I love this idea! It also seems like it would make a great get-acquainted activity for the beginning of the school year. The final products would make an attractive and engaging hall display. Hope you don't mind that I pinned it to my main Pinterest board (http://pinterest.com/1grateful1/teaching-having-fun-w-kids/)? I also try to share the best pins on my Facebook page and blog. Thanks for sharing this fun, easy, and versatile idea!